We already shared SAP Performance Tuning in very detailed steps in the post SAP Performance Tuning. Now we are sharing the quick checks. I hope it will help you also. 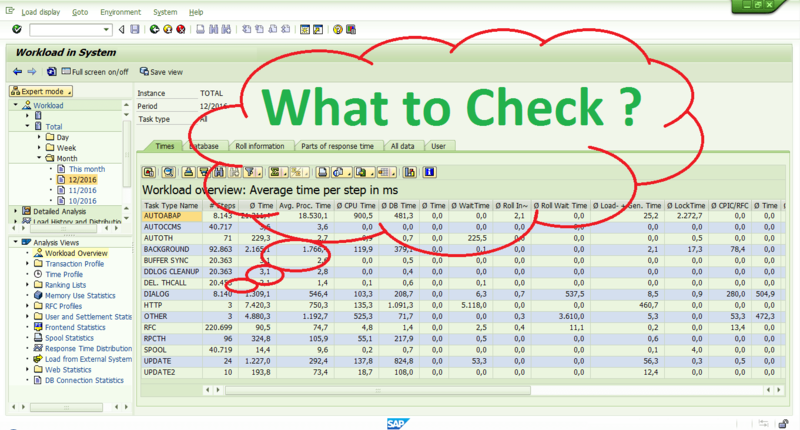 Few of my friends and colleagues are still asking as what needs to be checked in case of SAP performance issues ? Yes, there are many things to check and lot of things to be considered before we are going ahead with tuning part. In this post I would like to share a quick protocol on SAP Performance issues and troubleshooting. Short introduction on basic components which we are going to use commonly. If single user or single transaction getting this (large response time) performance problem, we need to tune the program which is causing large response time. From ST03, the average response time for dialog-step should not be more than 1000 ms or 1200 ms.
We can check for missing indexes in DB02 (detail analysis-missing indexes), if we find any missing indexes then we have to re-create the indexes for proper fields. We can analyze the time consuming transaction using STAT and request ABAPers to make correction of wrong logic or reprogram. If all transactions are getting the (large response time) performance problem we need to analyze the programs which are causing large Wait Time, large roll- wait time, and large load time, large DB request time, large CPU time and large processing time. It can problem with long running jobs. We can identify the long running jobs by using SM50 or SM66 and tune that long running job or terminate them. Work processes are blocked by long running reports, this problem occurring frequently we need to increase the work processes. If user starts the programs such as reports with very long response times, the affected work processes may be occupied for several minutes. This means that number of remaining work processes is not sufficient to process the queries of other users, which could cause wait times. We can check for missing indexes in DB02, if we find any missing indexes and create the indexes for proper fields. Also Check the expensive SQL statements in St04,which are taking High disk reads, High buffer gets/misses monitoring (detailed analysis menu-SQL request tab),if we got any expensive SQL statement ,we need to optimize that SQL statement by ABAP‘ers. Check and update CBO statistics (DB21). It can be a problem with wrong logic of the ABAP program. We can analyze the time-consuming transaction using STAT. Than request ABAPers to make correction of wrong logic or reprogram. From ST03 -We can check the average RFC + CPIC time this time indicates the time for establishing an RFC connection. This average RFC time should be less than 10 ms.
From ST06, we can check the CPU idle %, if high CPU loads (the CPU Idle average per hour is less than 40%, if it is more than 40% can be a problem with logic of the current executing program. We can check the LAN communication from ST06 (detail analysis menu –check by ping tab). Nice checking for SAP performance and it’s truly good..
>>From ST03, the average response time for dialog-step should not be more than 1000 ms or 1200 ms.
Can you say about this numbers? Is it official SAP values?